I :oops: acquired :oops: my first ever pallet today! From the tile warehouse - so romantic! I have a pile of pallets in my front drive waiting to become a fence at my new lottie (goes dreamy eyed and sighs in contentment ). But there aren't enough, so I shall be hunting some more down very soon. went to a bonfire the other night nearly had a dizzy fit when I realised they were burning pallets, what a waste! But daughter went to ask them and they were all damaged. What a good daughter to go and ask just to reasure her insane mother even though she thinks collecting pallets is a very strange hobby, bordering on insanity! And I hadn't even asked her to ask, must have done something right with this child! I get loads, enough to keep my woodburner going all day. oh richy, I am going to be pacing all night now just thinking about burning pallets! What a good daughter to go and ask just to reasure her insane mother even though she thinks collecting pallets is a very strange hobby, bordering on insanity! And I hadn't even asked her to ask, must have done something right with this child! Thats funny my dds do the same they point out skips to me while we're driving - a hunting instinct seems to come out in them when they know there's stuff out there for free that they can bring home to the nest/den/cave. Bless. 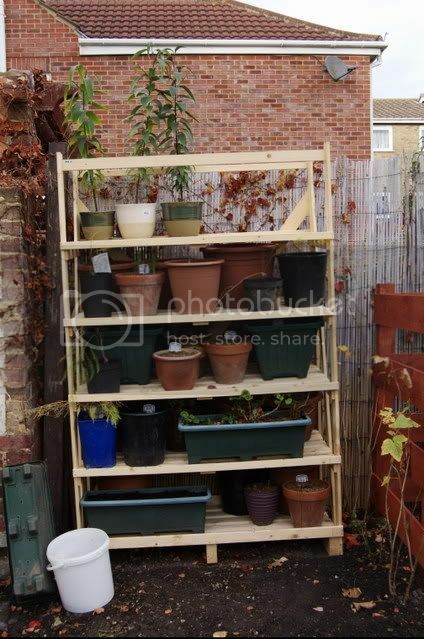 On my travels around the borough I just happend to pass a supermarket loading bay and near to the skip was a 6ft high display staging it was used to display boxes of bulbs. So a quick word with the fork-lift driver and it was on my roof bars quicker than you could say "Do you want to swap some home brew for that?" Life? Don't talk to me about life!! Well Shaun there was another one there but postge to Cheshire from Hampshire is going to be a problem!